Mechanical analysis of a pNIPAM block fabricated by 3D laser lithography. a) Optical micrograph in the AFM with overlayed indications for the force measurements and the line-scan. Scale bar is 50 µm. b) Measured Young’s Modulus as a function of temperature for a stepwise heating and cooling of the sample. c) Height measurement via line-scanning from the glass substrate on top of the pNIPAM block. The different colors depict several cycles of heating and cooling. Credit: Hippler et al. A team of researchers at Karlsruhe Institute of Technology (KIT) and Heidelberg University have recently introduced functional 3-D hetero-microstructures based on Poly (N-isopropylacrylamide) (pNIPAM) a polymer that responds to changes in temperature close to its lower critical solution temperature. Stimuli-responsive microstructures are of key importance for the creation of adaptable systems, which can have interesting applications in soft robotics and biosciences. For practical application, however, materials need to be compatible with aqueous environments while also enabling the manufacturing of 3-D structures, for instance, using 3-D printing. "3-D printing by direct laser writing is a powerful technique enabling the manufacturing of almost all arbitrary stable structures in the micrometer range," Marc Hippler, one of the researchers who carried out the study, told TechXplore. 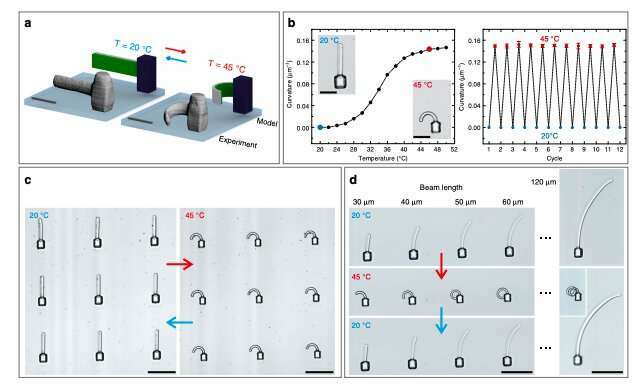 "However, for many applications, especially in the biomedical field, it is desirable to change the properties of the resulting microstructure on demand, as this enables the step from passive to active systems. We wanted to present a powerful and versatile technique to create such structures." In order to achieve complex actuation patterns, researchers need to use materials that react differently to external stimuli, such as temperature and light. Hippler and his colleagues thus developed new 3-D hetero-microstructures based on N-isopropylacrylamide, a temperature-responsive monomer that is commercially available. Stimuli-responsive pNIPAM valves in PETA microchannels. a) 3D reconstruction of experimental data recorded via confocal laser scanning microscopy. Two different color channels have been recorded, allowing to separate the fluorescence from the PETA with the green fluorescent DETC and that from pNIPAM with the red fluorescent rhodamine dye. The corresponding iso-intensity surfaces are colored in turquoise and gray, respectively. Upon heating the sample to 45 °C, the opening in the middle widens. This process is reversible when cooling the sample back down. b) Open area in the middle of the microchannel at 20 °C and 45 °C for multiple cycles of stimulation. We find no significant deterioration. c) Alternative design with an additional inner tube and two pNIPAM-tori. Complete closure of the microchannel can be achieved in a reversible manner. Scale bars are 30 µm. Credit: Hippler et al. "One important goal of our study was to achieve strong responses with a 'mild' stimulus," Hippler said. "By increasing the temperature only slightly above room temperature we stay in a physiological range, which makes the system interesting for biological applications. One could, for example, think about single cells in 3-D scaffolds that are mechanically stimulated by their environment. We also demonstrated that this technique could be useful for other fields, such as microfluidics or soft robotics." Hippler and his colleagues demonstrated that by changing the local exposure dose in 3-D laser lithography, the material parameters could be altered on demand. They then explored this possibility further to create 3-D architectures with large amplitude and complex responses. Using their method, the researchers successfully created active structures that exhibit a large-amplitude response to changes in temperature. In addition, they showed that the response of these structures can be activated both globally, by changing the water temperature, and locally, by illuminating the desired microstructure with a laser focus. Temperature-induced actuation using pNIPAM-based hetero-microstructures. a) Scheme of bi-material hetero-structures with the two materials highlighted in green and gray, lower and higher dose exposure, respectively. These can be compared with the 3D reconstructions of measured fluorescence image stacks. The two temperatures T = 20 °C and T = 45 °C are highlighted in blue and red, respectively. The beams start straight at T = 20 °C and are curved at T = 45 °C. b Curvature, i.e., inverse radius obtained by fitting a circle to the experimental data, versus temperature. The right-hand side panel shows the result of twelve temperature cycles without deterioration (error bars are s.d.). c) Bright-field optical micrographs of a 3 × 3 array of nominally identical structures to demonstrate the reproducibility. d) Temperature dependence of five structures with different beam lengths prepared under identical fabrication conditions. Scale bars are 20 µm in a and b and 50 µm in c and d. Credit: Hippler et al. "We demonstrated a very versatile and powerful technique that can be employed and used by other people," Hippler said. "I think three of the main aspects of our study are the creation of materials with largely different properties out of a single photoresist, the strong actuation due to a mild stimulus and the opportunity to use light to trigger the response. Due to this versatility, we didn't focus on one particular application, but highlighted different possibilities." In the future, these findings could inform the development of materials with applications in a variety of fields, including microfluidics, soft robotics and biosciences. Hippler will now continue working on this system, specifically focusing on biological experiments. "Additionally, we will be investigating other stimuli-responsive material systems with interesting properties that could be used for direct laser writing," he said.